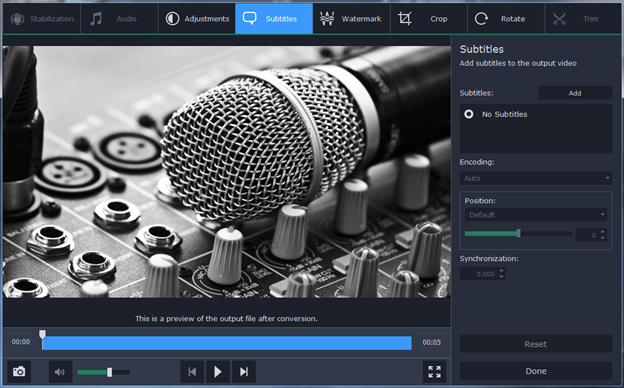 Movavi is one of the perfect options for extracting audio from the video because it is the powerful tool that also works with more than 170 media formats. Movavi is really simple at the same time powerful software that extracts audio from video fast. At the same time, Movavi provides complete control, so it is simple to control the process. Also, the user can do necessary actions including dragging and dropping elements, resizing windows, dragging sliders, etc. overall; Movavi is perfect for extracting audio from video without any loss. The easy to use options makes Movavi Video Editor stand out. Additionally, the Movavi software comes with powerful video editing features that also give full control. Install Movavi Software: to initiate the process you need to download Movavi video converter, then open the file. Add A File: after that you need to click add media option which is available on the left corner of the program interface. So you must choose the file that you need to extract audio. Movavi also have the ability to extract audio from several files at once. Select The Fragment For Conversion: Based on your needs you just choose the relevant option and click the edit button. After that new window appears, in that window you just set the beginning and ending points. Then the program starts to convert the section of the file. Once you have finished the process, then click done. Select a Format: after conversion process, you just open the list of forms and choose the option. Save The Result: Finally, save the audio file to a folder, then click convert also just wait for few seconds until converter has finished recording respecting audio from your video, once the process is completed then you will get the converted audio file, and it will open automatically. Finally, you will get extracting music from video. Movavi Video Converter is the really awesome choice for extracting audio from the video also it allows the user to create as well as edit video files. Movavi is the ultimate collection of editing tools and best for video processing.